As I mentioned earlier, I have been a bit away from Second Life. It was due to my old stucky Macbook, all sorts of things with RL and general lack of inspiration about SL. Now that I'm back I feel almost as lost as the day I first rezzed. Everything is different. Many of the old favourite stores are now gone, everything is in mesh and half of the places I used to go hang have vanished. Because of this I took my SLurls list, dropped all the content from it and started a new Shop and go SL list with SLurls and Marketplace links. Because I don't know how to use the new search effectively, I'm relying on other blogs and Second Life Destination Guide on finding pretty places to roam and take photos. 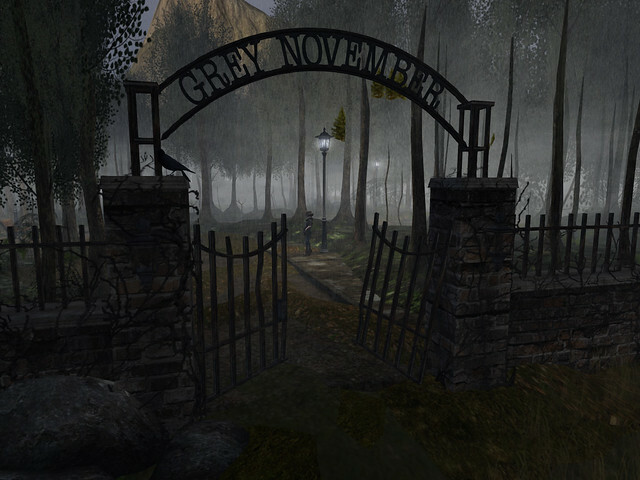 Through the last one I found grey november gallery, which looks pretty much like my RL right now. If anyone tells you there's snow in Finland at the moment, they are either much Norther than me or are lying. If you have suggestions for places to go or clothes and other things to shop, do tell me. You can drop a line on the comment box below this post email me or IM inworld. I'd love your help!